The culture clash between Garrison Keillor, creator of “A Prairie Home Companion,” and Robert Altman, filmmaker of standouts “Nashville,” “The Player” and “Short Cuts,” is one of good-natured hokum (Keillor) and razor-sharp cynicism (Altman). When it comes to movies, especially those meant for adult audiences, I’d take cynicism every time. 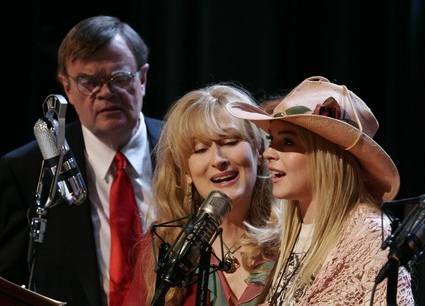 “A Prairie Home Companion” has been airing regularly (except for a break in the 1980s) on public radio stations across America and Keillor, who wrote the screenplay in addition to starring in the film, stays true to the radio show’s Americana format. There are live bands and singers, a crime series featuring Guy Noir (Kevin Kline), anecdotes from small town life and make-believe commercials for homespun items like Powder Milk Biscuits. Tweaks that separate the movie from the long-running radio program include Tommy Lee Jones as a Texas businessman who has come to shut down Prairie Home Companion and Virginia Madsen as a mystery woman in a white trench coat. The one tweak that’s desperately missing is Altman’s biting dialogue, complex characters and mature themes. “Prairie Home Companion” is good-natured, aw shucks cinema patched together like a filmed stage play or concert. It’s the last thing one would expect from Altman because, well, it’s a waste of his wonderful, mean spirit. Granted, the film has its share of beautiful images. There’s no denying Altman’s skill. Meryl Streep and Lily Tomlin add sass as the country singing due Yolanda and Rhonda Johnson. But the film never rises above affable – much like Keillor with his dark blue suit, white dress short and banker’s tie. It’s easygoing, chatter and homespun advice and Altman has better things to offer than that. “A Prairie Home Companion” premiered at the 2006 Berlin Film Festival. Picturehouse released the film in theaters across America earlier this summer. The premise of an America divided by red (Conservative Republican) and blue (Liberal Democratic) states was moonshine clear in first-time feature director Phil Morrison’s extraordinary Southern drama “Junebug.” It was the standout film at the 2005 Sundance Film Festival for a simple reason. Morrison shattered the Sundance storytelling formula that liberals are good and tolerant and conservatives are rigid and bad. Working from Angus MacLachlan’s script, Morrison looked at the American divide with impressive tolerance. In ‘Junebug,’ Madeleine (Embeth Davidtz), a pretty Chicago gallery owner who deals in outsider art accompanies her new husband George (Alessandro Nivola) to North Carolina to meet a rural painter. While there, they decide to visit his family, conservative Christians who instantly clash with Madeleine. In a move that continues to surprise audiences (“Junebug” played U.S. theaters last summer and is currently on home video), Madeleine comes off as rigid and intolerant. Meanwhile, George’s ultra-right family is shown honestly, flaws and all, but ultimately in a positive light as they strive to accept their son’s big city, college-educated, arty wife. George, played with charisma by Nivola, is the most attractive conservative ever to appear on film. When he sings a gospel hymn at a church potluck, the moment is beautiful. Morrison revisits the idea of an America divided into cool and square communities with his series of “Get a Mac” Apple Computer ads. The series of six commercials cover Mac selling points like avoiding viruses, the ease of working with other gadgets and glowing consumer reviews. Shaggy-haired and soft-spoken Justin Long, seen in the films “Waiting” and “Jeepers Creepers,” plays the Mac computer as a cool and confident hipster in blue jeans and a casual top. John Hodgman, a regular on “The Daily Show with Jon Stewart,” plays the PC as a doughy nerd in an ill-fitting suit, the type of geek who breaks into a sweat any time a pretty woman passes. Morrison’s “Get a Mac” ads are the polar opposite of “Junebug.” The geeks, the conservatives, in this case, PC owners, are nothing more than inept buffoons. There’s none of the tolerance Morrison showed in “Junebug,” a movie that celebrated both the cool and un-cool. For the sake of boosting Apple Computer sales and emphasizing the ads’ jokes, tolerance is tossed out the TV screen. Still, when it comes to portraying an America as two divided communities, even down to the computers they own, Phil Morrison has become the leading storyteller. “Junebug” premiered at the 2005 Sundance Film Festival and is available on home video from Sony. The “Get a Mac” ads can be seen on a variety of screens (TV, computer etc) at all times.